Editor’s Note: Even tough this article was first written in 2012, I periodically update the information to keep it current. I try to answer as many general questions in the comments as I can. I cannot always verify the veracity or accuracy of information or recommendations provided by readers in comments. If you would like me to evaluate a brand or product not mentioned on the list in this post, or if you would like individualized advice for your cat, please schedule a consultation. This post contains some affiliate links*. If you’ve read this blog for any length of time, you know that I’m passionate about species-appropriate nutrition for cats. Cats are obligate carnivores, and they need meat not only to survive, but to thrive. 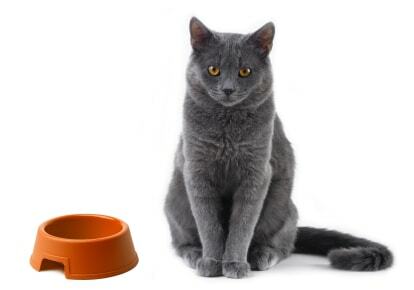 The optimal diet for a cat is a properly formulated raw, home-cooked or grain-free canned diet. Cats shouldn’t eat dry food; even the grain-free dry varieties are too high in carbohydrates. Dry food is the equivalent of junk food for cats. It’s really not all that different from feeding sugared cereals to kids. Cats are obligate carnivores: this means they need meat not just to survive, but to thrive. They cannot get enough nutritional support from plant-based proteins such as grains and vegetables, because, unlike humans and dogs, they lack the specific enzyme that processes plant-based proteins metabolically. They need few or no carbohydrates in their diet. Feeding foods high in carbohydrates can lead to any number of degenerative diseases, including diabetes, kidney disease, and inflammatory bowel disease. Dry food is the leading cause of most urinary tract problems, and it is responsible for the obesity problem among cats. Dry food has also been implicated as one of the contributing factors to diabetes, which is reaching epidemic proportions. 1 in 50 cats may be affected, with overweight cats being at increased risk. And contrary to the myth that just won’t die, dry food does not clean your cat’s teeth. Most cats don’t chew their kibble long enough for any of the scraping action that is the theory behind this myth to kick in. What little they do chew shatters into small pieces. Some pet food manufacturers offer a “dental diet” that is made up of larger than normal sized kibble to encourage chewing, but in my years at veterinary practices, I’ve seen many cats swallow even those larger size pieces whole. Additionally, dry food leaves a carbohydrate residue in the cat’s mouth that actually encourages growth of tartar and plaque. Ideally, I’d like to see no carrageenan in the food. Some of the brands on the list below have carrageenan in some of their flavors, so check labels carefully. Ideally, I’d like a food to be GMO-free. Some of the brands on the list below may contain GMO’s. A word about fish: most cats love fish-based foods. I recommend using them sparingly or avoiding them altogether. The primary fish used in cat food are salmon, tilefish (usually identifed as ocean whitefish on the label) and tuna. Each of them presents health issues, because fish can contain toxic doses of common water pollutants, heavy metals, and other contaminants. Sadly, much of the fish that goes into pet food is contaminated with heavy metals and other toxins. (On a side note, that is also true for fish sold for human consumption.) Mercury is considered one of the top ten chemicals of major public health concern by the World Health Organization. Fish used in pet food manufacturing often contains whole fish, guts and bones, which can increase phosphorus levels of the food. This can be a problem for cats with kidney disease. Some cats are sensitive to fish-based diets and develop urinary tract problems that resolve when fish is removed from their diet. Additionally, fish based foods may contain menadione, a synthetic form of vitamin K, which has been banned by the FDA for use in human supplements. I am often asked what brands I recommend. Unfortunately, there are many diets on the market that sound good based on what the pretty packaging says, but when you take a closer look at the label, you realize that there’s not much substance behind the marketing claims. The brands listed below are foods that I either currently feed to Allegra and Ruby, or have fed to them in the past. This list is not meant to be exclusive, and it does not mean that there aren’t other really good diets out there. It just means that these brands are the ones I’m comfortable with after doing thorough research. Weruva Read my full review of this brand here. Wervua is available from Amazon at very competitive prices with free shipping for Prime members. Nature’s Variety Instinct Canned Some Nature’s Variety Instinct formulas are available from Amazon at very competitive prices with free shipping for Prime members. Tiki Cat. I only recommend the poultry-based flavors. Tiki Cat is available from Amazon at very competitive prices with free shipping for Prime members. Soulistic. This brand is exclusively sold by Petco (and also available from Amazon ), but is produced under the same processing standards as Weruva. Addiction I only recommend the carrageenan free formulas. They are a bit higher in carbs than I like to see, but I still consider it a good brand. Primal Pet Foods Primal Pet Foods dehydrated formulas are available from Amazon at very competitive prices with free shipping for Prime members. *FTC Disclosure: The Conscious Cat is a participant in the Amazon Services LLC Associates Program, an affiliate advertising program designed to provide a means for sites to earn advertising fees by advertising and linking to products on Amazon. The Conscious Cat is an affiliate partner of NomNomNow. This means that if you decide to purchase through any of our links, we get a small commission. We only spread the word about products and services we’ve either used or would use ourselves. My cat is super finicky and will only eat a pâté style of wet food. Any suggestions? I’ve been feeding him Wellness chicken and turkey pâté but he has developed an aversion to them. I’m pretty desperate. Hi! I’ve read this article several times in the past, and came back to it because I’m looking for a new food to add into our rotation. I seem to remember Natire’s Logic being on your list, and it’s one my cat Misty seems to do very well with. Has there been a change to this product that resulted in it being removed from your list of recommended foods? Thank you! I still think Nature’s Logic is a good food, but the veggie/fruit content is a bit higher than I’d like to see in their new formulas. That’s good to know, thank you! I wasn’t aware they had updated their formulas. I’m going to try adding Dr. Elsey’s and Nature’s Variety Instinct into the mix. They seem comparable to Nature’s Logic, with far fewer fruits and vegetables. I always mix a pate with Weruva Cats in the Kitchen chicken or turkey…so hopefully Misty will have a quick and easy transition! Thanks again. The raw frozen bites are a complete raw frozen meat diet, not kibble, and yes, they are a good choice. I don’t see Small Batch on our list of raw food and wanted get your thoughts about it. Our kids love it. We had tried many prior. I think it’s a great brand and I really wanted my girls to love it, but they’re kind of “meh” about it. My 12 year old cat was just diagnosed with cancer. He is also diabetic, but in remission. He has a tumor in his stomach area. This is all new to me and I’m trying to gather as much information as possible. I’d like to know what food is the best type/kind for him to eat? I want to ensure the highest quality of care and food for him. Thank you in advance for your time. Thank you, Ingrid. Based on the info in your blog, I went to the store this week and purchased several quality can foods for Johnny. I’m quickly learning that the “junk” can food, and tuna water, might be the only two things that encourages him to eat right now. So, as you said, eating something is better than not eating at all. What are your thoughts on feeding him cooked meat and tuna water… or baby food? I will grab some nutritional yeast and bone broth today. Also, surgery is not an option and my vet thinks euthanasia is the path to take. I’m choosing to honor him and this stage of his journey by saying no to chemo or radiation and opting for a more holistic route. Signs of cancer cachexia are present, but he’s still using the litter box, playing some, moving and jumping, responding to touch, toys and love and eating some… these are all good signs imo. He is on CBD oil and fluids now and there is an immune support product for cats with cancer that I ordered. Any thoughts on this product? It is called Life Gold by Pet Well-being. Thank you for the additional links, Ingrid. My kitties are my babies and your blog has been helpful on many levels. Shelly, thank you for sharing with me. Ozone therapy and Luxolite are on my list to research now. Good to hear that about the Life Gold! A few of the reviews had me concerned. Did your cat like the taste of it? Any direct changes you noticed with Life Gold? So far, he’s not interested in home cooked meat, Nature’s Instinct protein or kitten food and he did not like the nutritional yeast either. We’re already on the filtered water (learned that with a bladder stone) and I’ll be sure to check out the Primal Freeze, too. No Simon did not like the taste of the Life Gold, so I put the dropper as far back to the side of his mouth to get it in him and try to by pass a lot of his taste buds. Simon was already pretty far into stage 4 when I started it, so I did not see outwardly signs other than he lived a pretty descent life for another year along with the Luxolite clay. I’ve continued raw feeding since and all of my other cats like it cold right out of the fridge. Balanced Blends out of Colorado would be my favorite complete raw pet food. I also get raw food from Raw Feeding Miami.The food from this company is truly raw, with this food “chicken grinds” I add Alnutrin Supplements individual packets that are pre measured for 1 pound pkg of meat. No I do not cook the food as that actually cooks out the nutrients, but like I said I may just slightly warm it, but its still raw when they eat it. Sick cats are naturally more picky in MHO. Here are a couple of good sites, the first one was a blog that I followed at the same time, although her kitty lived longer than mine http://catwithcancer.blogspot.com/search/label/Natrum%20Phos https://www.petcoach.co/article/feeding-the-cat-with-cancer/ Hopefully its ok that I’ve posted these 2 sites. I invested a large amount of my time learning how to make Simon comfortable with the hopes of betting his cancer. If your kitty won’t eat, the vet can prescribe for you an antihystamine that will make him hungry. If you would like me to share all the websites that I collected in hopes of saving my cat, you can find me on facebook under Shelley Bennett my picture shows a dog and cat setting together in the yard and you can msg me. Ingrid there is a new food called tiny tiger on chewy. Have you looked at it and thoughts? At a quick glance, they use by-products, potato starch is high on the list of ingredients, and they use “natural flavors,” which can mean a lot of different things. Granted I’m not Ingrid, but I have a ton of experience in this, working for a popular NYC animal rescue for nearly 20 years. But, no. Not at all. That alone doesn’t make them bad. What makes Tiny Tiger questionable is when *entire cases* of the food are donated to our shelter, and our shelter animals won’t eat it. They clearly have quality standards different than whatever the main production line is, because every 3rd can in the case is ignored and buried by cats that are not remotely ‘spoiled’ and were scavenging and/or living off human food scraps until they were rescued. That is not a good sign, regardless of what any label says. It may be a way to dump substandard food on the market, it may be a legitimate attempt to make a high-quality affordable cat food. I have no idea, nor am I judging them. I’m just sharing the experience of someone who opens cases of food at a time, not single cans. There’s something up with this stuff if rescues won’t eat it. Thank you for your thoughtful comment, Mike! Hi, Ingrid! I was hoping to find recommendations for kitten food but most of the canned formulas recommended here do not even have a kitten formula. Also, I wanted to let you know so you can update your list: Bravo no longer has canned options, raw only. And Nature’s Logic canned says on their website “to be used as intermittent or supplement feeding only”. Of the 1 or 2 brands listed here that do have kitten formulas, they are 11-12% in protein which seems to be a bit too much right now for my little girl (very stinky b.m. and gassy). Anyway, LOVE what you do – just wanted to let you know so you can update and maybe offer some kitten suggestions down the road. Thanks! **I was basing the info on Bravo and Nature’s Logic by their brand websites. Kittens can eat adult formulas, they just need more food per pound of body weight than adult cats, and they will need more frequent meals. Use label recommendations as a starting point, and feed your kitten as much canned or raw food as she will eat until she is about four to six months old, in three or four meals a day, then she can be fed as an adult cat. Thanks for the info on Bravo and Nature’s Logic! I raised my Scottish Fold on a well-regarded dry food. I continued with the adult dry food of the same brand. The only canned food she would eat was absolute junk. She also began to pork out on only 1/3 cup this dry food. I then abandoned dry food completely and switched her to FreshPet Select. It is a refrigerated, cooked food (not raw), chicken flavor. She is doing great: plush coat, minimal defecation, improved muscle tone, and clean teeth (I am a veterinarian, too, and I also believe that dry food does not translate to clean teeth). I would recommend this food to those that want to feed a fresh, minimally-processed food but raw is not an option for them. Thank you for sharing your experience with a minimally processed diet, Melissa. It’s always refreshing to hear a veterinarian help dispel the myth that dry food cleans teeth. Hi! Have you looked into Cornucopia? I’m curious to see your thoughts. I have two senior cats, one of which is having struggles with liver issues. The Vet recommended Hills prescription diet, which I obviously refuse to feed. They haven’t eaten dry in years. I’ve tried almost every food out there! My liver kitty has to be careful with sodium, so it’s a challenge. I tried the Cornucopia food on a whim out of desperation. I just wish so many of the formulas didn’t have fish! Though it is wild-caught. They also have some type of allergies! I tried the NV LID Turkey, but they hate the peas! I’m not familiar with Cornucopia, but would be happy to evaluate it for you. Best cat food on the market. I live in Canada and I ship it to a US address and bring it over. Saved my kitty. RE: Soulistic. I can’t find any flavors other than chicken that do not have tuna. Am I missing them? I’ve been buying Grain free Gluten free Soulistic Duck Dinner in Gravy, Lamb Dinner in Gravy and Beef Dinner in gravy. I just noticed that all of these have tuna broth as the first ingredient and tuna as the third ingredient. In fact the only Soulistic I could find without fish was chicken. I am trying to rotate through choices other than chicken. My kitties were loving Soulistic. Thank you for your great website! Yes, the only Soulistic flavors without fish are the two chicken ones. I just bought the chicken and turkey which does not contain any fish and is carrageenan free unlike some of their others. My cat loves it! I reviewed this line in 2015 and liked it. https://consciouscat.net/2015/06/05/review-merrick-limited-ingredient-diet/ Since then, Merrick has been bought out by Purina, and I don’t know whether the formulas have remained the same or whether they’ve changed since then. Deboned Chicken, Chicken Broth, Chicken Liver, Natural Flavor, Pea Protein, Calcium Carbonate, Organic Dried Alfalfa Meal, Sodium Phosphate, Guar Gum, Potassium Chloride, Taurine, Salt, Choline Chloride, Flaxseed Oil, Yucca Schidigera Extract, Minerals (Zinc Amino Acid Complex, Iron Amino Acid Complex, Manganese Amino Acid Complex, Copper Amino Acid Complex, Potassium Iodide, Cobalt Glucoheptonate, Sodium Selenite) , Vitamins (Vitamin E Supplement, Vitamin B12 Supplement, d-Calcium Pantothenate, Vitamin A Supplement, Niacin, Vitamin D3 Supplement, Riboflavin Supplement, Pyridoxine Hydrochloride, Folic Acid, Biotin, Thiamine Mononitrate). Whats the besr food for my cat, she seams bloated, and big belly, is dry food no good.. If your cat seems bloated, you need to get her checked out by your vet. As I explain in this article, cats should never eat dry food. You can find the brands/foods I recommend in the list in this article. Just acquired a kibble addicted 5 year old cat that I hope to transition to wet canned, and eventually raw. He will only eat pate (doesn’t like Tiki Cat, for example or real cooked meat) in very small quantities. Your article doesn’t mention pea protein, which I am seeing in foods and dislike. Any suggestions for a pate with no veggies or fruit, carageenan, peas or pea protein? Don’t like to see flaxseed either as it gets rancid very easily, but this may be a tall order. Thank you. I agree with you on pea protein being a poor substitute for meat protein. Of course, it’s cheaper, which is why it’s showing up in so many formulas. Try Dr. Elsey’s, Bravo, or Hound and Gatos – when I last checked, none of them contained pea protein, but formulas change, so it’s always a good idea to read labels. Our 2 cats would NOT eat anything with peas in it. So after trying about a dozen other brands, we finally came up with Merrick’s Limited Ingredient chicken or turkey – pate. The Pate was the key. We also add to that Life Extension Multi-Nutrient Formula vitamins and home make poached ground chicken. It took a couple of weeks to wean them off kibble and onto our recipe, but now they’re fine. This is the first time I have been to this site. Hoping it is OK to ask a question. I have a 11 year old cat. Seems she has runny stool about every 3 or 4 days in the same exact place, which is right in front of our sliding patio door, where I will see it in the AM when I let the dog out. The vet thinks it is a behavior problem. I currently am feeding her Blue canned food. I also have another cat that I got 2 years ago but the cat that has the problem was doing it prior to getting this cat although the problem is getting more frequent. Do you think it would be helpful to give a probiotic or switch to one of the brands you have listed? A probiotic might help, but it does sound like there’s a stress/behavioral component to the issue. I would place a litter box in the spot where she eliminates and see if that fixes the problem. This is not a permanent solution, once she uses the box, you can very gradually move it to a better location in the same room. Is there a probiotic that you recommend? I was just told that grain free might not be the best for cats. Is there a update on the brand of can foods for our cats n kittens that is best for them? Even though the original post date is 2012, as stated in the annotation at the top of this post, this list is kept current. How do you feel about added salt (sodium chloride) in canned food? I have been doing extensive research on your recommended brands, and MOST of them have added salt listed as an ingredient. I’ve read salt causes heart and kidney disease and hypertension (much like in humans). I’m trying to feed the best possible canned food to my cats. Thank you for your help. I feed my cats canned cat food. Purina beyond is my choice with very little wellness indoor dry mixed in. Also backwoods wet is also good. I never would feed my cats raw. Too many problems. I don’t understand your comment about wellness food. I don’t use dry food. I do not recommend any foods with Carrageenan. Raw food is the optimal diet for cats, but I understand that not everyone is comfortable with it. The carrageenan – read online about this ingrienient . I feed my 3 cats with Blue Baflo can food with this ingrienient in and they ( 3 of them ) die with the same tammy cancer in 9 month time they all were gone . I still miss my cats ,they were not old to die . I haven’t looked at Wellness in a while, but all their formulas used to have carrageenan. It sounds like maybe they took it out? We have been feeding Vital Essentials, but have heard they are changing their formula and it has been so hard to get, so we tried Small Batch. They do list salmon oil in their ingredients. I was wondering if you are familar with the brand etc. Our Vet says they are comparable to VE. My cat seems to have a sensative stomach and vomits up her food every few days. Raw diets have been tried in the past and she is now eating Tiki cat wet food. She also eats a dry kibble, grain free, Vital Cat duck flavored. She has also been allowed to eat the dog’s dry kibble; Stella and Chewy’s raw blend. Her vomit tends to be chunky as though she is not completely digesting the dry kibble. Any thoughts or ideas? Thanks! I’m not sure if you — or anyone else, really — will read this comment, but I’ll try anyway as a desperate first-time cat owner. I adopted my cat, Diamond, from a local shelter at the end of June. In pretty much every way she is healthy, and at her checkup in July, the vet was super impressed with her health. However, being a girl in her 20’s who’s never owned a cat before, I simply followed the diet they had been giving her at the shelter. They would free-feed the cats kibble but give them two wet food meals a day. So…that’s what I did. Diamond was a bit picky about the wet food but she loves dry food to the point that she will eat no matter WHAT I put down in front of her. This is where the problem lies: last night, before bed, I tried to simply just “put away” her kibble, and she went nuts. Like, whining and climbing on me and purring in my ears kind of nuts. A lot of the websites on transitioning cats from a dry to wet diet only account for cats eating dry kibble on a free-feed schedule, but Diamond and I are a bit different. I’ve done a lot of research on how to wean her off of the kibble, but again, none of them are really relevant for us. Sorry for the long comment, but I’m just not sure what to do anymore! Any guidance you could provide, or resources you could point me toward, would be incredibly appreciated. Thank you so much, and thank you for all you do for the kitties with your site! I’m co-signing Ingrid’s comments. Cats are creatures of habit. Just be patient and remember not to beat yourself up over it. Since my cats still prefer some kibble, and i do leave 60kcals out at night since they are actively playing when I’m asleep, I purchased water fountains to encourage them to drink more water. I prefer the Pagoda style that Ingrid recommended because it’s an ideal size for cats,made of ceramic and not plastic, and has parts that are easy to clean. Make sure you transition them to the best quality kibble you can afford, if they are eating a cheaper variety. Make sure you check the Guaranteed Analysis and look for .2% taurine. You might only get as close as .15%. Taurine is super important for cats. Wet foods more than always have less than dry food and raw diets typically can not guarantee any taurine. A food can claim to be natural but if it doesnt have the necessary nutrients for your cat, it’s not a superior alternative. So recognize you may have to add taurine and other supplements. This is shedding season so make sure you brush your cat frequentl in addition to making sure their diet contains omega 3 and 6 fatty acids. Many dry foods add these as well. It helps keep their coat nice and shiny. Also make sure you give them something like Tomyln laxatone a few days a week to help them pass furballs and also poop easier with all of that dry food in their system.. Getting them to take it may be tricky. I wipe a small dallop on top of my cats upper lip on the side, wait for them ro lick it off, then apply more when it’s done. Greenies Smartbites are a good supplement. That’s the basics. Other than scheduled playtime around feeding (Da bird and laser toys are sure hits) to encourage them to eat more at feeding time and rest afterwards, you’re good to go. Hi, I’ve just started feeding Weruva. they do like the fish products. Are the fish products also the same human grade food as the chicken? I understand that fish should be limited but they get tired of the Fowl Ball and the Double Dip. Unfortunately one of my cats is food sensitive to the Lamb so I’m limited. Also I was going to try them on the GO cat food but all of their food contains salmon even if the name of the food is chicken. Thank you for the helpful article. My problem is none of the commercial brands listed seem to have KITTEN food. What would you recommend for a kitten? thank you.